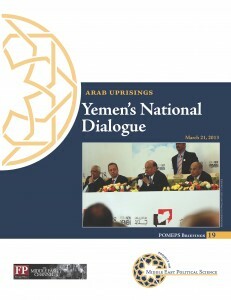 Yemen began its long-awaited National Dialogue Conference this week in Sanaa. The NDC hoped to find some zone of consensus for moving forward in its transition from the long rule of Ali Abdullah Saleh. It has been beset by many problems of representation, withdrawals and boycotts, deeply entrenched divisions, and the perception of irrelevance to the real problems of Yemenis. For a while it looked like it might never actually convene. Pingback: Welcome to The Monkey Cage!